Inheritance Tax is a uniquely unpopular tax. Although first conceived for reasonable reasons (it was designed to break up particularly large estates upon the death of the owner), it has failed to keep up with rising house prices and rapidly increasing average wealth. As such, Inheritance Tax (IHT) now affects a far higher proportion of the population than was initially intended. A huge industry has grown up around Inheritance Tax avoidance. There are countless professionals on hand to help you minimise your Inheritance Tax bill and ensure that your beneficiaries are not landed with a hefty tax liability after your death. However, while professional advice is often recommended (particularly if your estate is unusually large or your affairs are especially complicated), there are several simple tasks that you can perform yourself to help make sure you minimise your Inheritance Tax liability as far as possible. 1. 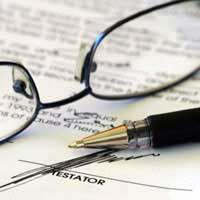 Write a will – and make sure it is watertight. Your will should be the cornerstone of any strategy to cut your IHT bill. Unless your will is legally valid you run the risk of having your assets disbursed according to probate rules. Aside from the fact that your estate will therefore not be dealt with as you would have wished, this means that your beneficiaries could face a crippling IHT bill. Spend some time getting your will right. 2. Make good use of the allowances. The government has recently changed the rules on the Nil-Rate Band, making it easier for spouses to share their allowances. Most assets passed between spouses or civil partners are exempt from IHT, so make sure that you use your Nil-Rate Band to pass assets on to other beneficiaries where possible. 3. Learn the rules on gifting. Every individual is allowed to make gifts up to a value of £3,000 that will be exempt from Inheritance Tax. It is therefore possible to disburse some of your assets before your death. This has the added benefit of ensuring that you are still around to see your beneficiaries make use of your gifts. Similarly, any gifts made above this threshold may be treated as Potentially Exempt Transfers (PETs). This means that they will also not be subject to Inheritance Tax, as long as you survive for a further seven years after they are made. Other transactions, such as transfers of assets into some trusts, will also be treated as PETs. PETs are obviously only useful if you are confident that you will live for a further seven years. 4. Use a trust – but use it wisely. The government has spent a lot of time cracking down on the use of trusts for the purposes of IHT avoidance. Trusts were previously seen as a magic bullet for minimising an IHT bill, but the recent closure of various loopholes has meant that their efficiency has been significantly reduced. However, trusts do still have their uses; you may want to read other articles on this site for more information on using trusts to cut your IHT bill. There are a huge number of companies providing advice and information on how to avoid Inheritance Tax – but this advice can be very expensive. By taking the basic steps outlined here, you can mitigate or eliminate your IHT bill without the need for professional help.